Magnesium News Transdermal Magnesium - Myth or Reality? The word ‘transdermal’ refers to elements passing through the skin, that is, either exiting or entering. The epidermal layer of the skin is a membrane with channels that open and close as a response to various stimulants. For instance, when you perspire your sweat glands release perspiration which is mostly made up of water, electrolytes and some waste products. If there is a lot of heat a small amount of the skin ceramides (solid fats), which are part of the skin barrier, can melt (fluidify). This means that we can also lose some oils that protect the skin barrier. Athletes will notice this effect more. After a big training session the skin feels more sensitive and open to the environment until it can restore protective cholesterol fats. What Can be Absorbed from the Skin? 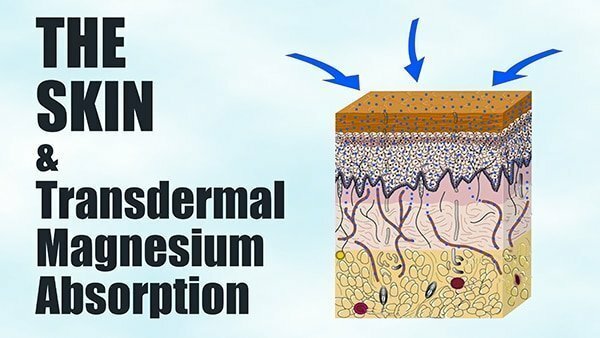 Transdermal magnesium absorption means that magnesium ions (electrolytes) can pass into the epidermis (outer layer) of the skin, which acts as a nutritional reservoir until the tiny capillaries of the dermis underneath can absorb nutrients as required. From this skin reservoir the body may also absorb the vitamin D it made when you got some sunshine on your skin. You can also use the transdermal method to absorb iodine (Lugols Solution or generic). For example, after painting the soles or toes of your feet (or a patch somewhere else) with iodine before you go to bed, if the colour has disappeared the next day, then your body has been hungry for iodine. Do it for a few days until the colour remains in the skin the next day. This is how you know you have enough iodine for the time being. Keep testing regularly to stay topped up because iodine is another nutrient in short supply in foods these days. Did you know that the breast tissue competes with the thyroid for iodine? I sometimes put the iodine under my breasts too. Transdermal absorption of nutrients is a wonderful way to supplement-feed the body when you are not sure how much is enough, as the process of nutritional absorption is self-regulating. On the other hand, one should be mindful of avoiding synthetic chemicals that the body does not know how to treat and that can get access to the body’s interior via the skin. We have been indoctrinated for generations to believe that oral consumption and digestion of foods and tablet supplements (or drugs) were the only way for nutrients and drugs to access the body, except for medicines which can be injected. However, transdermal absorption of medicines has been a recent development with the popularisation of nicotine patches or progesterone cream. The success of these options has led to further investigation regarding the use of transdermal drugs. Most of the medical community have not been trained extensively in transdermal absorption, except insofar as they do now prescribe transdermal nicotine patches, progesterone cream and other transdermal drug products. Drugs can also be delivered via inhaling of puffers because the lung sacs have very sensitive membranes which offer an efficient route for blood vessel uptake. We have also accepted that essential oil aromas can penetrate the body via epidermis as well as inhalation of steam diffusion. When it comes to transdermal nutrition, that is a whole new revolution in thinking and science. The process of transdermal uptake is self-regulating and when saturation is reached the absorption ceases – until more is required later. Nutrients just sit inside the skin layer until used up by the body. More magnesium faster where it needs to go and no diarrhea – voila! 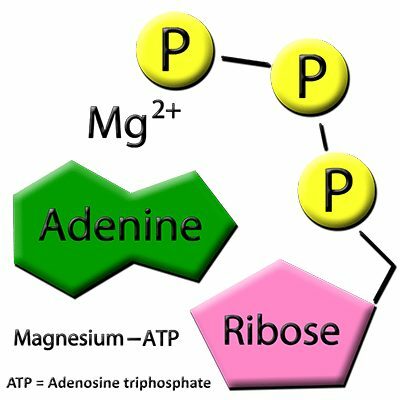 Magnesium uptake into cells fuels the mitochondrial production of ATP electrical energy and so directly influences metabolism. Magnesium enables us to plug into our bio-electrical power point. Cell membranes, including the membranes of skin cells, depend on magnesium ions and readily take them up when available. Magnesium is actually an integral part of the cell membrane, as it delivers the right charge for the integrity of the lipid bilayer, which then regulates calcium influx and efflux as required for tension and relaxation. Magnesium also helps to maintain good hydration via its hydration shell and affinity for water. It also acts as a powerful anti-inflammatory as well as a relaxant to recover from stress, heart arrhythmia and cardiovascular tension. Magnesium supports enzyme activity via mitochondrial ATP energy production and thereby also co-factors with numerous other nutrients. This is an electrolyte you cannot do without! The process of transdermal uptake is self-regulating and when saturation is reached the absorption ceases – until more is required later. Nutrients just sit inside the skin layer until used up by the body. Why Does Magnesium Oil Feel Slippery? Magnesium oil is a concentrated solution of magnesium chloride flakes and water which forms a slippery oily texture, but it’s actually water-based. The water feels slippery because the water molecules are more tightly ordered with less spaces due to the magnesium charge, which influences water molecules to form planar structures which slide over one another. Straight magnesium oil can sit on the skin for too long causing a prickly irritation, especially if skin is sensitive and lacks enough natural fats. This is because the skin barrier, made up of fats, repels water. However some of the magnesium does penetrate if it combines with the natural oils of the skin. The best way to ensure optimal transdermal magnesium absorption is to combine magnesium chloride with plant oils, such as in Elektra Magnesium Cream. In this form it can be absorbed more efficiently inside the epidermal layer where it helps to plump up skin cells with extra hydration and protection of skin barrier, leaving the skin with a healthy glow and condition. Over time magnesium helps to build collagen structures which can hold an optimal amount of oil and water, resulting in a more youthful complexion. The epidermis in this way acts as a nutrient reservoir that the blood vessels of the dermis have access to when the body needs a top up. We have only just begun on this journey of investigation, research and development of magnesium body care products, but for the first few years since 2009 the results have been impressive. There are some early studies listed below on transdermal absorption of magnesium – the master mineral electrolyte. It’s a good idea not to rely on a magnesium blood test to determine your body’s magnesium status. 99% of magnesium in the body is stored in the tissue cells of muscle and bone and not in blood plasma, which contains less than 1%. You can’t get an accurate measurement of magnesium in tissue cells with just a blood test because the tissue cells can sacrifice their stored magnesium to top up the blood level and keep it in a narrow and strict range. “The total serum magnesium concentration, imperfect as it may be, is the entry level test to evaluate magnesium status in humans. The serum magnesium concentration is primarily controlled by the kidney and the dietary intake of magnesium. When magnesium levels get too low in blood then you can be sure that tissue levels are extra low! Magnesium charge is necessary to hold our protein structures together and to provide sufficient charge for cell membrane integrity which controls calcium movements. You could be experiencing magnesium deficiency symptoms like cramps or hypercalcemia, but still have magnesium show in the normal range in blood. Without a tissue magnesium test you won’t know the real magnesium status of the body. Stress is a major trigger for loss of magnesium stores, but some people have a genetic predisposition to excessive loss of magnesium (even without a lot of stress) via urine, which is called ‘hypermagnesuria’. The assumption that many have held is that if you are excreting excess magnesium in the urine then your tissue cells must be replete because the body only excretes excess. This is not the case. Like blood tests, the measurement of magnesium in urine is not always an accurate indicator of stored magnesium either. However, symptoms can be a very good guide to indicate deficiency if you can’t get a tissue analysis. At least people can feel secure in the consensus that there is no danger of overdose with transdermal natural magnesium salts application – as there would be if you applied transdermal drugs and chemical creams daily. With natural magnesium salts you can feel tangible results and there are no contra-indications with medications. In fact, magnesium supplementation is often used by doctors to alleviate drug side effects because many drugs (particularly poly-pharmacy) can rob the body of magnesium stores causing cramps and other magnesium deficiency symptoms. However tablets and powders are very inefficient delivery methods to get optimal magnesium absorption. Some gets through to the interior of the body, but most is expelled via the digestive system. Elektra Magnesium Cream is gaining an excellent reputation as an alternative to cortisone cream to calm down inflammation, provide good skin care and to massage and relax a cramped muscle, without negative side effects. It’s just natural nutrition being delivered via skin. There is a growing awareness in the market of the need to eat and absorb natural and organic food so as to avoid chemicals. This also applies to absorption via skin – the largest organ of the body. Toxic elements commonly found in personal care products like synthetic parabens, pthalates and other petrochemicals can be absorbed transdermally and build up in organs over time. Many of these chemicals are known endocrine disruptors and carcinogens. Read labels and become a conscientious consumer of nutritious plant and natural mineral salt ingredients (ie, real food and not petroleum-based products) for healthy skin care. 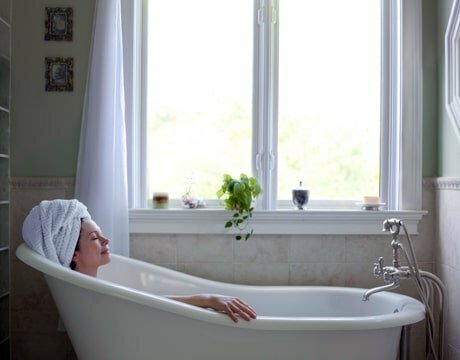 There are more magnesium body care products popping up recently which contain petrochemical derived and synthetic chemical ingredients as emulsifiers and preservatives. Watch out for added synthetic chemical ingredients like petrolatum, petroleum jelly, paraffin, dimethicone, phenoxyethanol, parabens and pthalates. This list is by no means exhaustive. If you are not sure about an ingredient then look it up on several websites that specialise in this area to get the best overview. A lot more research is now being undertaken by pharmaceutical companies to deliver drug therapy via skin. The reason they are investing more into this method of drug delivery is because people’s digestive systems can become so compromised that they are unable to digest tablets enough to receive the intended dose from the drug. The main issue they have encountered in their transdermal research however is that they can’t effectively control the exact dose via skin. To help drugs get in through the skin they use chemical ‘partners’ called ‘penetration enhancers’. These include mainly alcohols or sulphates. Too many alcohols and sulphates can break or damage the skin barrier. In addition, the transdermal product needs to be lipid based so it is compatible with the lipid mantle of the epidermis. The fatty protective layer of the skin keeps water out, so that water-based products are repelled by skin – skin that has enough fat-content that is. Compromised inflamed skin such as in psoriatic skin tends to have a shortage of fatty barrier protection and is more open to the atmosphere and absorption of substances. Some people have a very oily skin with tight junctions, or a thicker denser epidermis such as men compared to women. This large variability in skin types makes it very difficult to deliver an exact dose of a drug transdermally. Not enough drug penetration is ineffective and too much is detrimental when you are dealing with potent chemicals – especially when they add penetration enhancers to open up the skin barrier. Using ionised magnesium, that is natural magnesium chloride salts dissolved in water, allows the epidermis to soak up the magnesium without further digestion. This is because magnesium chloride solution is already in the right form for cells. Inside cells you will find predominantly ions of chloride, potassium and magnesium. The great benefit of transdermal magnesium is that magnesium is absorbed via the skin much more efficiently than if you were to ingest tablets or powders, which are hard to digest and absorb properly through the bowel wall, and especially if the digestive system is compromised by IBS or leaky gut. Also, the older we get the less stomach acid is produced, which makes it more difficult to break down magnesium tablets in the stomach. Some people have obstructions or built-up waste products on the gut lining which can hinder absorption of nutrients. Most people’s digestive systems eliminate the majority of the magnesium compounds ingested. Magnesium in high concentration in the gut will cause loose stool, diahrrea or irritation of the lining. In this case the magnesium is lost very quickly. Chelated magnesium products don’t have such a bad reputation for causing diahrrea, but still have to go through the digestive process and be able to pass through the gut wall, which can be an obstacle. You Are What You Can Absorb! The gut wall is naturally well suited to absorb the magnesium concentration we usually find in mineral waters or foods. The higher the concentration of magnesium, the more the absorption rate is curvilinear with a diminishing rate of absorption. Magnesium chloride has been found to be the most bioavailable form of magnesium and when dissolved in water can be easily taken up by cells without further absorption. If you add the food grade magnesium flakes to filtered drinking water you can make an hydrating and pleasant-drinking mineral water, however on its own it is not enough of a supplement for people that have high-end magnesium needs. You can absorb more magnesium ions transdermally than via the gut wall and this means that magnesium gets to where it is needed faster without having to go through hours of the digestive process first. Some people are misled by the assumption that the more elemental magnesium that there is in a food or substance, the more will be absorbed into cells. This is not the case. Certain plants like spinach can contain large amounts of magnesium but also usually contain oxalates which can block the uptake and use of magnesium. It’s best to cook the spinach to disable the oxalates from interfering with the work of magnesium. Another example where people can be misled is the larger amount of elemental magnesium contained in magnesium oxide. Because this compound is not very water soluble it is not readily taken up by cells and commonly only 4% is bioavailable. You need ample stomach acid to be able to digest the magnesium oxide so you can use some of the elemental magnesium. When magnesium oxide mixes with the hydrochloric acid of the stomach it is converted to magnesium chloride and water. This excess water can very quickly liquefy your stool and cause you to run to the bathroom! Magnesium oxide is often used as a bowel purge to alleviate constipation for this reason. If you get diarrhea from the higher concentration of magnesium you have lost it too early and it defeats the purpose of consuming it. In addition, the older we get the less stomach acid we make and the harder it is to break down the tablets. If you are ingesting magnesium oxide tablets they will contain fillers and binders which can also interfere with magnesium absorption. Transdermal absorption of minerals has been practised for thousands of years as people discovered that when they soaked in mineral-rich hot springs they experienced relief from arthritic pain and had a rejuvenation effect. This process is called ‘Balneotherapy’ and has been tested extensively in studies regarding artheriosclerosis, cholelithiasis of diabetes, and more. After soaking the skin in warm-hot magnesium water for 20-30 minutes the epidermis softens and opens up to allow some of the water to hydrate the skin layer. The magnesium ions, being fully dissolved and a component of the water molecule, are taken up inside the skin along with the water. This softening and hydration of the skin also allows stored toxins to be excreted by the skin. The magnesium chloride solution has had sodium removed, so it’s not the same as bathing in high concentration Dead Sea salt water with high sodium, which can create electrolyte imbalance because high sodium steals water – that is, contributes to dehydration. Magnesium on the other hand attracts water and increases hydration via its larger hydration shell. So ideally we want to favour more magnesium exposure transdermally. Now you can have a magnesium soak in the comfort of your own home. Try a footsoak with a tablespoon of Elektra Magnesium Flakes for half an hour, or a bath with a cup of flakes. You can also make an alkalising mouth wash that inhibit acid-forming bacteria. It also inhibits the build-up of unwanted calcium deposits on the outside of teeth because magnesium causes the excess calcium to move into the bones. Magnesium is a controller of calcium in the body. Our high concentration magnesium water-based solution, Magnesium Oil Spritz with pure essential aromatherapy oils, is also ideal for massaging into tight muscles or sore joints for relaxation and stimulation of blood flow to promote healing. It delivers the highest concentration of magnesium at 60% magnesium chloride hexahydrate. 7-8 sprays deliver over 400mg elemental magnesium. It is recommended for more acute conditions and combines well with the other magnesium products. 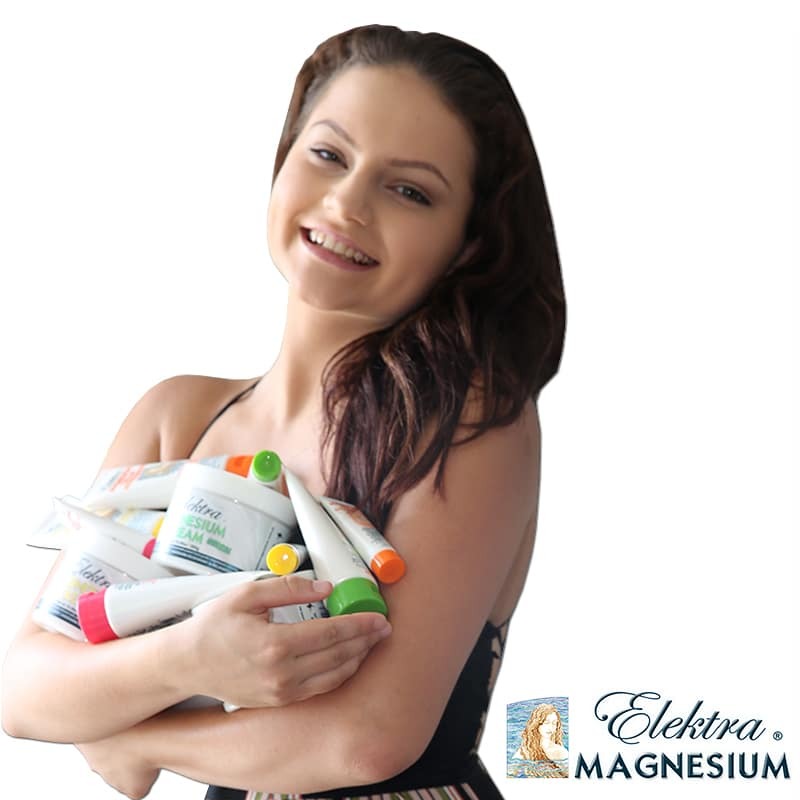 Elektra Magnesium Moisturizing Cream with specially blended natural plant oils infused with magnesium chloride hexahydrate (15%) not only keeps the skin well hydrated, soft and supple. It is a great delivery system for magnesium. A dessertspoonful delivers approx 300mg elemental magnesium. Use it all over the body, face and even as an underarm deodorant. People with very oily skin may find the cream slower to absorb, in which case application of Magnesium Charge Lotion (30%) might be more suitable because it has double the magnesium of magnesium cream but less fats. This means that less needs to be applied to get the same magnesium, ie. a dessertspoonful delivers 550mg elemental magnesium. Some people need up to 1000mg of magnesium per day if they have severe magnesium deficiency caused by high stress, excessive physical exercise, sleep deprivation, drugs, burns, operations or any other traumas or stresses. In this case they would need to combine a number of the above methods. The more opportunity you give your body to absorb what it needs the better. The body takes up the mineral ions it needs at that time. Absorption stops when saturation (equilibrium) is reached. The body is constantly needing a top-up. Just like you can’t drink a whole week’s worth of water on one day, you also need to apply and consume magnesium nutrition daily for optimal benefit. Think of transdermal absorption as offering your body a ‘smorgasbord’ of magnesium minerals and trace elements to choose from what it needs. You don’t know exactly how much your body needs, but it knows. 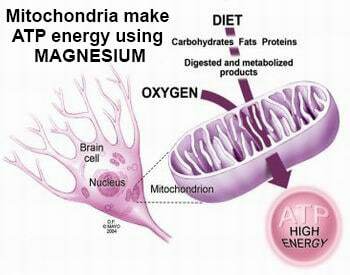 This need will also change from day to day depending on stresses (as magnesium is wasted and lost under stress). Every individual has differing needs and those needs will also fluctuate from day to day. When your body recovers its proper magnesium reserves, the symptoms of magnesium deficiency disappear. Symptoms of Magnesium Deficiency can include: heart arrhythmias, chronic fatigue, headaches, muscles cramps, twitches and restless legs, acute stress response, irritability and anxiety, insulin and blood sugar (metabolism) disorders, dry skin conditions like dermatitis, eczema and psoriasis, joint pain, inflammation, immune system disorders, vascular tension and high blood pressure and hypercalcaemia (depositing excess calcium in the soft tissue and joints). Ranade, V.V. and J.C. Somberg, Bioavailability and Pharmacokinetics of Magnesium After Administration of Magnesium Salts to Humans. American Journal of Therapeutics, 2001. 8(5): p. 345-357. Chandrasekaran, N., Effect of topical magnesium application on epidermal integrity and barrier function 2016, The University of Queensland. p. 84. Kass, L., et al., Effect of transdermal magnesium cream on serum and urinary magnesium levels in humans: A pilot study. PLoS ONE, 2017. 12(4): p. e0174817. Toft, G., H.B. Ravn, and V.E. Hjortdal, Intravenously and Topically Applied Magnesium in the Prevention of Arterial Thrombosis<sup>&#x2606;</sup>. Thrombosis Research, 2000. 99(1): p. 61-69. Sang-ngern, M., et al., Preliminary study of transdermal permeation of magnesium cream formulations across skin. 2012.